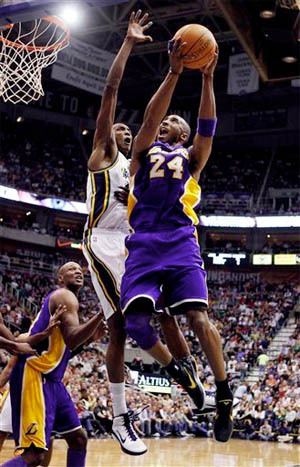 Kobe Bryant lays in two against Dallas. Not too much was made of the Lakers’ 0-8 preseason record, for the very reason that the games meant nothing. But after Tuesday’s season-opening embarrassing loss 99-91 to the Dallas Mavericks at Staples Center, one has to wonder if maybe there isn’t more to worry about. Once again on Tuesday the Lakers struggled to find any consistency offensively or defensively, looking very much like a team that hasn’t played together long. After leading early in the second quarter 33-25, they did little right after that, as the injury-depleted Mavericks rallied and took a 48-46 lead into halftime after strong play from their bench. For the game, Dallas’ bench outscored the Lakers’ 37-17. In the second half, things didn’t go much better, as the Lakers found themselves down by as many as 15 points several times, and they never made much of a run at any point. The final score and stats really aren’t indicative of how poorly they played, except for the pathetic 12-31 (38.7%) from the free throw line, which included a 3-14 night from Dwight Howard, making his Laker regular season debut. One of the few bright spots for the Lakers was the play of Pau Gasol who led all players with 23 points to go along with 13 rebounds and six assists. Kobe Bryant, who didn’t practice all week due to a strained foot, played, and hit 11-14 from the floor en route to 22 points. Dwight Howard did score 19 to go along with 10 rebounds, but struggled all night to get into the flow of the game, and eventually fouled out with about two minutes left. Dallas didn’t have anyone dominate the game, but got solid performances from several players, and had six players in double figures. Newcomer Darren Collison led Dallas with 17 points on 8-12 from the field. Brandan Wright, starting for the injured Chris Kaman, scored 14 on 5-5 from the floor. O.J. Mayo had 12, and Shawn Marion had 11 points and nine rebounds. Remember the Mavericks are also playing without All-Star forward Dirk Nowitsky. The Lakers did manage to shoot 49.4% from the floor, but were a miserable 3-13 (23.1%) from beyond the arc, with Steve Nash, also making his Laker debut, hitting just 1-4 from distance. They did cut down on the turnovers that plagued the team in the preseason, as they committed only 14 miscues. They did also outrebound Dallas 46-40. The Lakers will try to bounce back tomorrow in an arena they always struggle at, the Rose Garden in Portland, when they take on the Trail Blazers in the second game of a back-to-back. 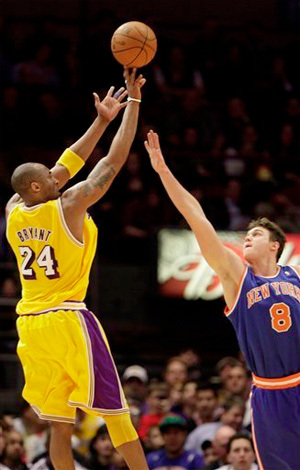 Kobe Bryant pours in two of his 33 against the Knicks. The Lakers had no problems putting away the Knicks early for the second time this season, as they rolled over the New Yorkers 113-96 at Madison Square Garden on Friday night. Kobe Bryant was the star on this night, unleashing his entire repertoire of shots on the star-filled New York crowd, as he played yet another stellar game in one of the NBA’s most-storied buildings. Bryant finished the game with 33 points and 10 rebounds on 12-17 shooting from the floor, playing just under 29 minutes. He scored 19 of his 33 in the first quarter, including a buzzer-beating turnaround jumper that put the Lakers up 30-28 after one. Pau Gasol had a solid game with 20 points and six rebounds, and he also got a long rest on the bench as the Lakers led by double-figures for most of the night. Lamar Odom had 14 points off the bench, Andrew Bynum scored 12 points and grabbed nine boards, and Shannon Brown hit six of his 10 shots, including a highlight-reel alley-oop dunk in the second quarter, en route to 12 points. The Knicks stayed close early, trailed by just two after one quarter, and took the lead early in the second. But the Lakers’ bench came in and took the game away from the home team, and the Lakers built a 62-48 lead at halftime. 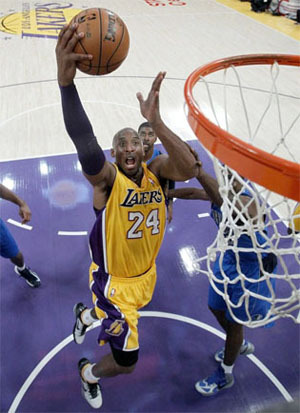 In the third quarter, Bryant hit a jumper over Danilo Gallinari to put the Lakers up 70-52. The Knicks then made their last real run of the night, going on a 10-1 burst to close to within nine at 71-62. But the Lakers responded and scored six straight, culminating with a three-pointer by Bryant from the right side to go up 77-62. New York never got closer than 11 points the rest of the game, trailing by as many as 20 in the fourth quarter, as the champs cruised to the easy victory. The Lakers shot 53.6% (45-84) from the field for the game, and 6-15 (40.0%) from the three-point line. But it was their defense that was most-impressive on this night, as they held the high-scoring Knicks to just 41.2% (32-85) from the floor and a miserable 5-20 (25.0%) from beyond the arc. New York did outrebound the Lakers 44-41, but most of that rebound advantage was gained in the fourth quarter with the game well over. Amar’e Stoudemire led the Knicks with 20 points and 10 rebounds, but shot just 9-20 from the field, turning the ball over six times, and picking up a technical foul. Raymond Felton had a solid all-around game with 20 points and seven assist on 7-12 from the floor. Gallanari had 14 points, but hit just 4-15 from the field, including 0-6 from beyond the arc. The Knicks have now lost to the Lakers eight straight times, including four in a row at Madison Square Garden. The Lakers moved their road record to 19-8, which surprisingly now matches their home record. Los Angeles is now 4-0 on their current road trip, which takes them next to Orlando to go up against Dwight Howard and the Magic for the first time this season on Sunday. From there they head to Charlotte on Monday, and finish off the seven-game trip on Wednesday against the woeful Cleveland Cavaliers.